Last week I wrote a piece about my unwillingness to “purchase” the NFL “product” any longer. Apparently, I hit a nerve…..with a sledge hammer. It is difficult to state everything that one is thinking in a short column, so this is an attempt to add some additional points and clarify some previous ones. Before I go further, I would like to extend a heartfelt “Thank You” to everyone who read and shared the piece and even more, took the time to make a sincere comment about the topic. It is a blessing to have a platform allowing me to state what so many others were thinking. Furthermore, I would like to salute every service member for whom I had a voice to speak. Whether you spent time in combat, or like me, were fortunate to serve outside of a combat zone or during peacetime, thank you for your service. First, this is not a boycott for me. I’ve always thought of a boycott as a temporary ban until a desired behavior is corrected. I don’t intend to go back to the NFL anytime soon, if ever. I stopped watching baseball for over 20 years after the strike and had forgotten why I stopped watching until a friend jarred my memory. Although the flag protests strengthened my resolve, I had stopped watching long before Colin Kaepernick took a knee. For starters, I have never been a huge fan of professional sports. It’s not that I don’t appreciate the talent of the athletes, I just don’t like the commercialization and many other reasons previously listed. I am not bothered by the huge salaries, since that is what the market demands; and after all, I am a capitalist. The ill treatment of Rush Limbaugh carried significant weight in my not watching, as did previous halftime performances at the Superbowl. I was already not watching when Janet Jackson had her “wardrobe malfunction”. Previously, I mentioned that I don’t care for hip hop music, which automatically makes me a racist in some minds. For the record, I don’t like Justin Bieber, either. I don’t like most country music of late. I don’t like R&B, except for “old school” blues. I don’t watch late night “comedians,” nor have I habitually watched anything on network television for probably almost a decade. For that matter, I don’t like 95% of what comes out of the music and entertainment industry these days. I would rather be waterboarded for 5 minutes than sit through the Emmys, MTV Awards, the Oscars, or any other Hollywood tripe. The NFL is just another dirty diaper in the landfill that has become the entertainment industry. My father was a successful high school coach, and I learned about sportsmanship at a very early age. The dancing in the end zone, the grandstanding, the “in your face” jawing, and the unsportsmanlike conduct that has become commonplace has no room in sport for me. So, I don’t watch it. It’s not a racial issue, it’s called being a decent human being. This is probably the biggest reason my NFL viewership slowed to a drip many years ago. The flag protests turned off the water at the source and plugged the well. In the piece, I referred to the hip hop culture as being violent, and that the NFL has immersed itself in that culture. That observation was based on the music being played at the last NFL game I attended. One need to look no further than rapper XXXtentacion’s recent video for which I refuse to provide a link. The video depicts the lynching of a child who happens to be white. While I did not suggest that the NFL openly approves of such violence, I do find it interesting that they tend to be slow in condemning such violence or suspending players accused of violence. Michael Vick, who served 21 months in prison for animal abuse played a couple more seasons after his release. As of late last month, he is being paid by Fox Sports as an NFL Studio Analyst. And they wonder why they are losing viewers? For me one example like this is enough, just like the Anthem protesters. 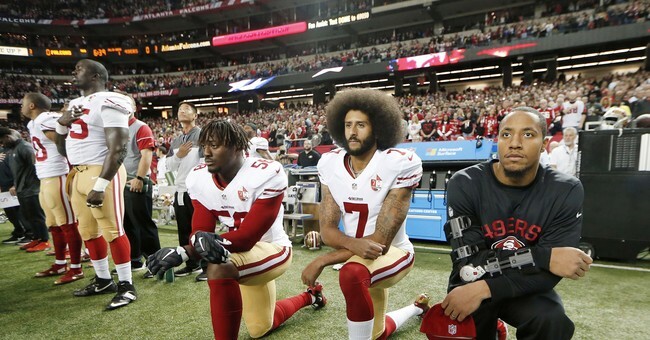 On the other hand, police officers who have been the subject of most of the NFL protesting are normally immediately suspended until an investigation has taken place, and it would be nearly impossible to find an example of one returning to his former post after being convicted of a crime. Interestingly, the NFL actually has a lower rate of arrests than does the population of the USA as a whole, according to www.nflarrest.com - which is a gem of a site I found in my research. One could argue that this is because many of these athletes are protected from arrest like other celebrities. However, one could never prove that point one way or the other. Again, it is the blind eye towards actual offenders that bothers me, which is not the same as suggesting every NFL player is a wife beater, drunk driver, or animal abuser. In writing on this topic, it has been necessary for me to read and research the subject more fully. It was painful. The most interesting were the excuses for the recent decline in NFL viewership. They have blamed it on everything from hurricanes to poor play to unexciting match-ups. The only one more clueless in this country as to why a certain phenomenon is taking place is Hillary Clinton - or maybe the press when it comes to Islamic terrorism. A terrorist shouts, “Allahu Akbar”, before he detonates a suicide vest and today’s “journalists” wonder what motivated him? I can only hope that at some point Hillary names me directly at least by reason number 3,492. If you want to know why Hillary lost, I would suggest reading this by one of my favorite authors. I was shocked to get a call from an ESPN publication’s writer who was doing a piece on the boycott. We had a nice chat, and I clarified some of my remarks which apparently weren’t what they were looking for since none were quoted in the story. For me, it wasn’t about race, although more than one commenter stated that my piece was racist. I suggested to my interviewer that, yes, I do believe that some racism does exist, but that I didn’t think America is inherently racist nor are law enforcement officers. My reasons are many, and I hope to address them in a future column. Yes, there are exceptions, but they are few and far between. The writer asked what I thought should be done to the flag protesters. I am very satisfied that Colin Kaepernick does not have a job. The market has spoken. If I were an owner or in the NFL leadership, flag protesting would get you a fine followed by progressively higher fines, then suspension with eventual termination. Professional athletes have plenty of places to voice their opinions outside of their work space. This is simply an employer/employee arrangement that has nothing to do with free speech. Try taking a knee or holding up a fist the next time the boss is giving a presentation and see where that gets you. The NFL should be no different. For those who would like to see the game banned because of head injuries, I’m not in that camp. If you want to take extra risks for exceptional pay or free college, then have at it. Just don’t ask me to pay for your mistakes when you are unable to function physically. After all, I signed my life away for a $140 per month G.I Bill. Who am I to condemn playing a sport you love for money? And finally, for those protesting the NFL to reinstate Colin Kaepernick, have at it. It’s a free country. Perhaps instead of protesting, you could solicit several millions of dollars in donations to hire him as a spokesperson for your cause. I hear he is available.